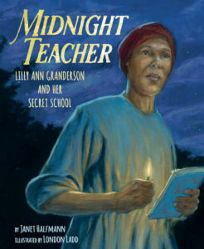 Midnight Teacher by Janet Halfmann is the story of one woman’s courageous journey to improve the lives of others through literacy. Born into slavery, Lilly Ann Granderson was sold to a slave owner in Kentucky after the death of her mother. The master’s children would often play school and gave Lilly an old speller and taught her to read. She began sharing this gift of reading with others on the plantation. Once the owner died, she was sold to a cotton plantation in Mississippi, where it was illegal for slaves to learn to read. Undeterred, she restarted her school, teaching late at night to avoid being caught. The school grew. When patrollers discovered the slave school Lilly faced a hard punishment, but the authorities eventually ruled there was no law against a slave teaching other slaves. What I admire about Halfmann’s biographies is that she highlights people who have made a difference in this world long past the pivotal times in which they lived. Granderson’s story displays her tremendous strength and determination to offer a gift that others took for granted because it was never a right denied to them. She knew the risks and faced them without fear of the consequences because she believed education was the path to freedom for her people. Between Halfmann’s moving text and London Ladd’s stunning artwork, the reader is immediately drawn into Granderson’s story. A perfect book for any school or personal library, Midnight Teacher could inspire many school projects and empower young people to action for the causes for which they are passionate. 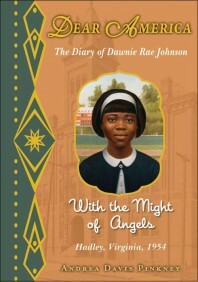 The year is 1960, and six-year-old Ruby Bridges and her family have recently moved from Mississippi to New Orleans in search of a better life. When a judge orders Ruby to attend first grade at William Frantz Elementary, an all-white school, Ruby must face angry mobs of parents who refuse to send their children to school with her. 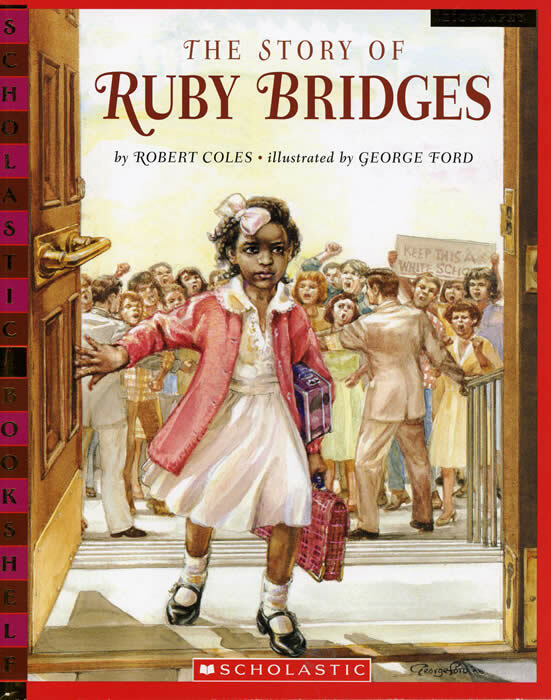 Told with Robert Coles’ powerful narrative and dramatically illustrated by George Ford, Ruby’s story of courage, faith, and hope is now available in this special 50th anniversary edition with an updated afterword! about the people, experiences, and events that shaped African American history. This expanded edition contains new material throughout, including additional information and biographies. Children will have fun designing an African mask, making a medallion like those worn by early abolitionists, playing the rhyming game “Juba,” inventing Brer Rabbit riddles, and creating a unity cup for Kwanzaa. Along the way they will learn about inspiring African American artists, inventors, and heroes like Harriet Tubman, Benjamin Banneker, Rosa Parks, Langston Hughes, and Louis Armstrong, to name a few. 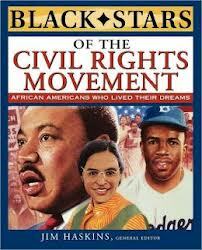 the country are reading the Black Stars biographies of African American heroes. * MAJOR GENERAL BENJAMIN O. DAVIS JR.
* ADAM CLAYTON POWELL JR.
* WHITNEY M. YOUNG JR.
Coretta Scott King winner Andrea Davis Pinkney brings her talents to a brand-new Dear America diary about the Civil Rights Movement. In the fall of 1955, twelve-year-old Dawn Rae Johnson’s life turns upside down. After the Supreme Court ruling in Brown v. Board of Education, Dawnie learns she will be attending a previously all-white school. She’s the only one of her friends to go to this new school and to leave the comfort of all that is familiar to face great uncertainty in the school year ahead. However, not everyone supports integration and much of the town is outraged at the decision. Dawnie must endure the harsh realities of racism firsthand, while continuing to work hard to get a good education and prove she deserves the opportunity. But the backlash against Dawnie’s attendance of an all-white school is more than she’s prepared for. When her father loses his job as a result, and her little brother is constantly bullied, Dawnie has to wonder if it’s worth it. In time, Dawnie learns that the true meaning of justice comes from remaining faithful to the integrity within oneself. Like every other kid in his class, Joe Stoshack has to write a report on an African American who’s made an important contribution to society. Unlike every other kid in his class, Joe has a special talent: with the help of old baseball cards, he can travel through time. 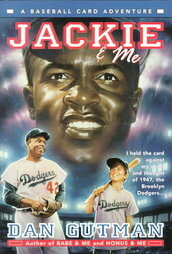 So for his report, Joe decides to go back to meet one of the greatest baseball players ever, Jackie Robinson, to find out what it was like to be the man who broke baseball’s color barrier. Joe plans on writing a prize-winning report. But he doesn’t plan on a trip that will for a short time change the color of his skin–and forever change his view of history and his definition of courage. So engaging it could be fiction, Seven Miles to Freedom: The Robert Smalls Story by Janet Halfmann should be in American classrooms everywhere. The story of Robert Smalls begins in 1939 with his birth into slavery in Charleston, South Carolina. A favored servant, Smalls has a decent life for a slave, but he witnesses firsthand the cruelty of this Peculiar Institution. As he grows from child into man, Smalls falls in love and longs for freedom for him and his family. 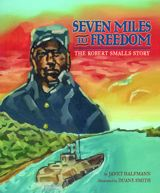 Seven Miles to Freedom shares how he leads a plot to steal a Confederate steamboat and pilots it into Union held territory. What a fascinating story! My Civil War collection is the most extensive in my home library. I have numerous non-fiction titles about a variety of topics on the War between the States. I will proudly add Seven Miles to Freedom by Janet Halfmann to my collection. Having enjoyed Halfmann’s Good Night, Little Sea Otter and Fur and Feathers, I knew the writing would be superb; but it can be difficult to make history interesting for young readers. Halfmann makes it look easy. It’s a true historical action adventure on the Atlantic. I wasn’t sure how I would like the impressionistic artwork for this book, but in the end I decided that Duane Smith’s creations were the perfect complement to the story. His style allows the reader to imagine this being any African-American slave’s story. Granted it is Smalls’s story, but the fact remains there were many brave African-Americans who helped the Union win the Civil War. It’s no wonder that Seven Miles to Freedom has won so many honors and awards. If you want to teach your children history in an engaging manner, you’ll want to pick up a copy of this one. I received a copy of this book from the publisher in exchange for my honest opinions. I received no monetary compensation to provide this review. 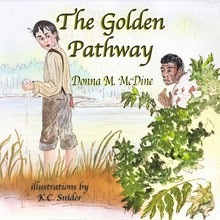 The Golden Pathway by Donna McDine is the touching story of one boy who is willing to take great risks to help someone in need. Every night David listens to his pa mete out his punishments on the slaves working their farm. He smells the alcohol on his breath. He watches as Ma is never treated with respect. He never expects his pa to be nice to him. One night after Pa whips their teenage slave, Jenkins, David sneaks out of the house and promises to help him escape to a better life. The Underground Railroad, also considered the “golden path to freedom”, helped numerous slaves escape the hardships foisted upon them by their owners. In this inspiring story, McDine has brought this portion of history to life for readers ages 9 to 12. The Golden Pathway shows how just one person who cares can make a difference in this world. It is a moving story that will educate readers and encourage them to be a person who makes a difference. I’ve been a fan of K.C. Snider’s artwork for some time, but she has truly outdone herself with The Golden Pathway. From the cover art to the interior illustrations, each brings David’s and Jenkins’ story to life in a visual way. From the tears running down David’s cheeks to a bent over Jenkins who has just endured another beating, and from chore time to a trip into town, Snider has captured every emotion, every tiny detail, right there on the page. The Golden Pathway nearly moved me to tears. As someone who has spent a great deal of time studying this period of American history, I’m certain this book has the ability to make a great impression on its readers. I highly recommend it. I hope it finds its way into schools and homes everywhere, as this is a message, you won’t want your kids to miss. 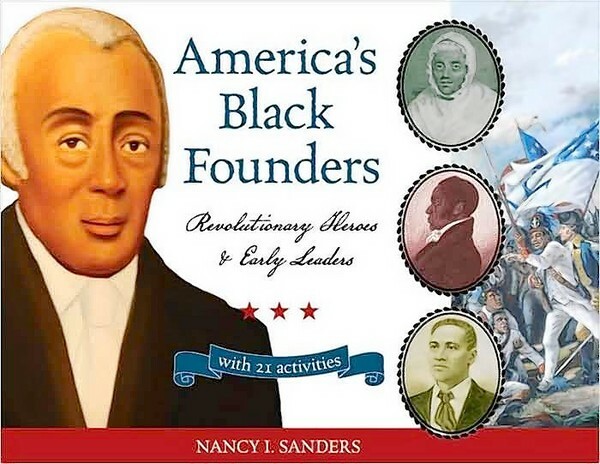 For an educational and fun reading experience look no further than America’s Black Founders: Revolutionary Heroes and Early Leaders by Nancy I. Sanders. In this engaging book geared for ages 9 – 12, Sanders brings America’s black Revolutionary hereos and early leaders to life with stories, historical photographs, and special features. While this book covers a variety of heroes and leaders–John Marrant, Lucy Terry Prince, Crispus Attucks, Salem Poor, Harry Hosier and many more–the story of Richard Allen, from his birth to his death flows through the entire book, weaving in and out of the times in which Allen lived. Also included are 21 activities that youngsters will enjoy. From stuffing a straw mattress to making a stamp, from how to pen a patriotic poem to designing a flag, and from reading the Declaration of Independence to exploring your family tree, these activities will keep your children or students entertained while they learn. The photography in this book is outstanding. It is also obvious that Sanders put a great deal of effort and research into America’s Black Founders. Classes that are studying Colonial America and Revolutionary times will definitely want to have this in their library. It is also a great read for Black History Month. I highly recommend America’s Black Founders by Nancy Sanders. You can find many more books by Sanders by checking out her website. 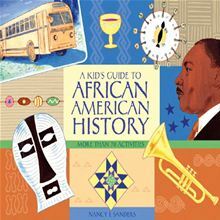 The Children’s and Teen’s Book Connection encourages you to celebrate Black History Month by selecting a few good books. Here are some of our picks! 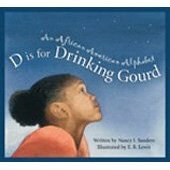 Amazon.com description: America’s Black Founders celebrates the lesser known but significant lives and contributions of our nation’s early African American leaders. Many know that the Revolutionary War’s first martyr, Crispus Attucks, a dockworker of African descent, was killed at the Boston Massacre. But far fewer know that the final conflict of the war, the Battle of Yorktown, was hastened to a conclusion by James Armistead Lafayette, a slave and spy who reported the battle plans of General Cornwallis to George Washington. Author Nancy Sanders weaves the histories of dozens of men and women—soldiers, sailors, ministers, poets, merchants, doctors, and other community leaders—who have earned proper recognition among the founders of the United States of America. To get a better sense of what these individuals accomplished and the times in which they lived, readers will celebrate Constitution Day, cook colonial foods, publish a newspaper, petition their government, and more. This valuable resource also includes a time line of significant events, a list of historic sites to visit or explore online, and Web resources for further study. Note: We will be reviewing this title at a later time. Scholastic description: A rich, poetic, alphabetical presentation of African-American history, including the Great Migration, the March on Washington, Malcolm X, and more. Scholastic description: A stirring look at the history of the fight for civil rights and the gains made since the fateful day of King’s death. With powerful photographs, illustrations, and more. Scholastic description: Dramatic and defining moments in American history come vividly to life in this series designed to make children feel they are on the scene as history is being made. Through text, illustrations, photographs, and engravings, these titles support history, social studies and geography curricula. Index included. The history of slavery in the United States extends from 1619 to the Emancipation Proclamation, but the story of racial injustice is much longer. Relive the struggle against segregation and inequality from the Civil War through the Montgomery Bus Boycotts to the Voting Rights Act of 1965. Scholastic description: Ellen Craft, Ida B. Wells, Toni Morrison – featured here are just a few of the African-American women who have enriched American life. Refusing to yield to discrimination and prejudice, these 10 women strove to be heard, to succeed, and to be free. Includes index and table of contents. Sassy tries out for a summer dance festival in Washington, D.C., despite the other girls’ taunts that she is much too tall. Note: This is by dancer and actor Debbie Allen known to people of my generation as the dance teacher from Fame (the movie and the series). My oldest daughter borrowed this book from the school library numerous times. It has an excellent storyline and is very inspirational.